Collabro will be back on the road next month for their biggest ever tour and have announced some very special guests joining them across the UK. West End and Broadway Star Kerry Ellis and BBC1’s Over the Rainbow Finalist and We Will Rock You Star Lauren Samuels will be joining the boys on selected dates. Since winning Britain’s Got Talent four years ago with one of the biggest majorities ever Collabro have released a Number 1 debut album “Stars”, followed by “Act Two” which peaked at Number 2, performed at the Royal Variety Performance; been voted ‘The Nation’s Favourite BGT Winner’ and are now enormously successful internationally. Notably, they have performed for over 30 million people in Japan on Music Station on two separate occasions – receiving a Gold Disc for Best International Artist alongside Sam Smith and Meghan Trainor. They have also completed two tours of America and signed a major US record deal. 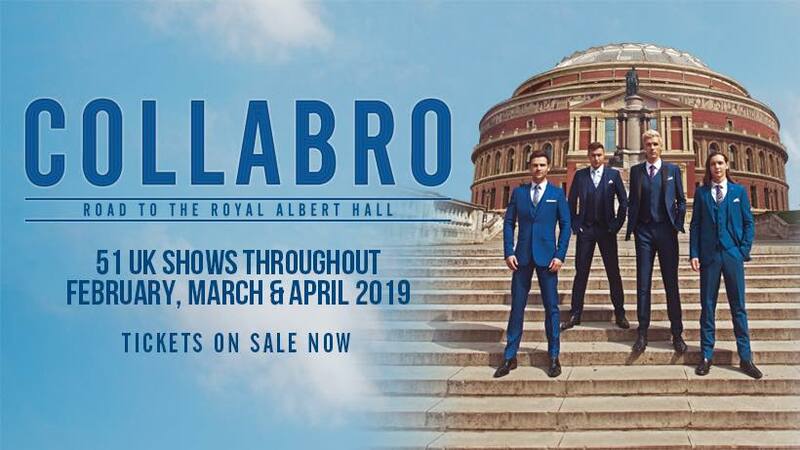 2018 has already seen Collabro embark on a sold-out tour of Asia, performed as special guests on Barry Manilow’s UK Arena Tour and release their fourth studio album ‘Road To The Royal Albert Hall’ for more information go to Officialcollabro.com. The musical theatre group’s ‘Road to the Royal Albert Hall’ Tour will be kicking off at South Shields Customs House on February 10th and will see the group perform at a variety of intimate theatres and iconic venues over three months, before finishing the tour at the world renowned Royal Albert Hall in London. Collabro will also have Youth Choirs to accompany them at each venue of their 51 date UK Tour alongside support Georgia and The Vintage Youth. Tickets are on sale now and available from www.gigsandtours.com 0844 811 0051, www.ticketmaster.co.uk 0844 826 2826, and direct from venue box offices.